Today I’m happy to welcome Sara Hathaway to Archer’s Aim for a Spotlight blog tour stop via Rave Reviews Book Club. She’s written a rather interesting book that I’m sure you’ll want to read. Take it away, Sara! When Day After Disaster was finally completed and the publisher was chosen, I was launched into the book-marketing world. I quickly found a use for the business management skills I studied in school. I had fine-tuned them in various positions before I became a published author but I had never worked for my own business. Even with the slight advantage of a business background, it has been an enthralling adventure full of knowledge to learn. More than anything though, I have met some outstanding mentors that have kept my efforts focused and my goals aimed at success. I graduated from The California State University of Sacramento in December of 2004, with a bachelor’s degree in General Business Management. While I studied business, I never could decide upon a specific area of business that I liked the most so I just studied them all, finance, marketing, human resources, entrepreneurship and more. In my career, I worked managing a smoothie shop and then managing an insurance office. This gave me a solid background in business operations and sales. When I started down this road of publishing, I understood immediately, I was putting together a new business based around my novel. I made a business plan and started to map out the steps I needed to take to navigate the path successfully. I took a clear look at the goals I was setting up for myself. I mapped out the financials of the business and how I was going to keep track of things. I needed to set up a game plan to pay back my biggest investor (my mother) and have extra money to be able to spend on promotions. I cruised along the business plan, joyfully filling in the categories with ease. Until, I got to the marketing section. My publishing company had provided me with some basic steps to take. They also made it very clear that the idea of me filling the shelves of a store with my books and having author book signings there with a line out the door was not going to happen. This privilege was reserved for the most well-known authors and honestly sometimes even they don’t have a very big turnout. So, what was I to do? How was I going to sell all of these boxes of books that showed up at my door? Obviously, I had some research to do. I started at the site LinkedIn. I got a membership and started joining some groups. I talked to authors and listened to their advice. I learned about things like Goodreads.com and facebook pages. I started researching some of my favorite authors to see who gave them endorsements and how they got that done. Unfortunately, I discovered that I was too close to my publication date to get many of those reviews. I had missed the starting gun but how is a new author to know? With the very limited funds I had, I needed to seek out information and advertising methods that were inexpensive but effective. I was willing to put in the work of sorting through the information and I wasn’t about to pay someone to do it for me. Maybe I am too controlling but I felt I needed to learn the process myself so if the time came where I was financially in a position to hire a marketer or agent, I would know if they were doing a quality job or not. One of the most awesome things I figured out while pouring through this information is that there is a big network of intelligent and helpful authors out there, who are willing to give you a hand if you just ask. I started delighting in the relationships I was building and then I met a lady named Sandra Beckwith. Sandra was the first author mentor I met who seemed to really care about getting authors quality information at a very low cost. Many people out there who claim they want to help you will only do so if you pay them lots of money. It is like trying to wade through a pool of sharks. Luckily, I found Sandra early before I had a chance to be bitten by those hungry monsters. I got tons of valuable information from Sandra and started to really develop some quality material but then it got better. She introduced me to a program that D’vorah Lansky was hosting called the 30-Day Book Marketing Challenge. Over the past year I have digested a ton of information and my desk is buried in notebooks overflowing with notes. It has made me into a totally different person. I have confidence and I am stretching my marketing muscles but I remember very clearly how difficult a process it has been. I realized that many new authors are at a big disadvantage. They are authors not business managers and marketers. Many have no idea how to get started or where to go for help. I was so blessed to have the background that I did and so lucky to have met some very influential mentors early in the process. I tell all the authors that I meet that I am here to help. I feel honored that they would want to pick my brain. There are so many aspects of this business that I am by no means a master but I will always lend a hand when I can. It was the people that reached out to me that got me where I am today and I would do nothing less for others. My own journey continues on as well. Currently, the sequel to Day After Disaster, the next book in The Changing Earth Series, is at the editor and will be released in a few months. I have participated in a Virtual Book Tour, I am conducting a Virtual Podcast Tour and soon I will be releasing my own podcast titled, The Changing Earth Podcast. I am still working through my list of marketing ideas because the list keeps growing and the ideas keep evolving. For all the authors reading this and wondering how I can help them, don’t be afraid to contact me, all of my contact information can be found on my website. In the meantime, I hope you enjoy the adventure in Day After Disaster and keep pushing to share your own message to the world. An author who talks about their book is an author that sells their book. Whenever you can find an appropriate time with anyone you are talking with bring up your book. Let them know you have been published and how awesome it feels. They will probably want to know what your book is about and may even buy one on the spot. Always have book with you! Talk with other authors. There is always something to learn from everyone. Even if that something is what not to do. Chances are though you will learn something you never even considered to add to your marketing options list. Keep knocking at those doors! Make a great big list of all the marketing ideas you gather from everywhere and keep going through the list from one idea to the next. Some will yield results some won’t but don’t stop trying. The rule of sales is some will, some won’t, some wait, so what. 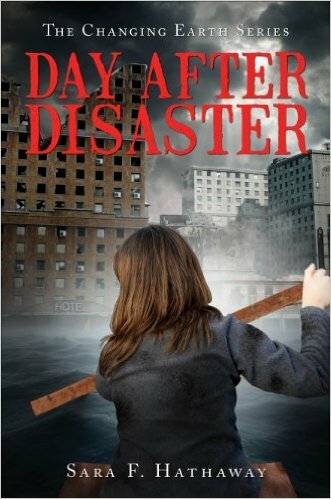 Day After Disaster is an apocalyptic, adventure novel, featuring a dynamic young woman, mother and wife, Erika, who is thrust into a world turned upside down by a series of natural disasters. Finding herself alone in a city mutilated by this disastrous situation, she must save herself. Once free of the city confines, she desperately tries to navigate through the foothills of the Sierra Nevada Mountains to get back home to her family. Not knowing if they are alive or dead she must call on all of her survival instincts to plot a course through this broken environment. Congratulations to Sara Hathaway on her book and Spotlight tour with RRBC. As always, please take a few minutes to look at Sara’s book and support this author. Please share your thoughts and ideas in the comments section. I’d also love to connect with you over social media so check my Contact page for that information. Want to be listed in The Bow of Destiny credits? Join the Insider Team to share upcoming links. Either way, you’ll be the first to have news about my books, especially some free offers this summer related to the upcoming release of The Bow of Destiny, the first novel of The Bow of Hart Saga. You’ll also receive a coupon to download my e-book short story, The Black Bag, for free as well as July’s free e-book: Recommended Reading for Authors!